Pritpaala originates from a Pauri by Guru Amardas in Suhi Ki Vaar. It expands on a concept introduced by Guru Nanak in the Mool Mantra, Saibhang, "Existing From Himself." To the best of my knowledge, this beautiful shabad has not been recorded by anyone. Much gratitude to Slovenian composer Katarina Koprivc for her original and beautiful composition "The Remains of Love," as well as to Enrico Nichelatti for Strings, Suellen Primost for Cello on this track. In this case, which is somewhat unusual, the music was composed before the melody. When I first heard this composition from Katarina, I loved it and wanted to sing something along with it. So I opened a random hymn from the Guru Granth Sahib using an iPhone app and sang along Katarina's composition the following Guru Amardas Pauri. 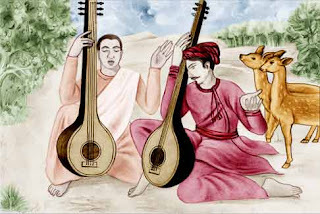 The Pauri is written in Raag Suhi, a raag about about love, so there was a coincidental match with Katarina's original title, The Remains of Love. But please be aware that this composition is not in Raag Suhi. Guru Amardas says, "Your created your own throne in the ethers and the ethers. Throne is the resting place for a king, the ruler, the emperor. The question is where is the resting place for God. Where does he sit? In Ramkali, Guru Arjan Dev says, "O king of kings, with the greatest court, final justice, the real doer of everything, you sit on the true throne." The Darbaar of Your Court is glorious and great. Your holy throne is True. In Raag Asa, Guru Nanak says that the one who sits on the throne is imbued in the five elements. So every element, every molecule, every atom is His throne. If you recognize, God resides in your heart. So my own heart is God's throne. Every heart is God's throne. Guru Nanak asks a question in the 27th pauri of Japji Sahib: Where does God sit and rule the world? Guru Nanak concludes that it is not "he" that is singing, it is really through the command of the supreme being that he is singing. Every heart is God's throne, and from there he makes Guru Nanak sing. Every heart is singing ... Sabhai Ghat Raam Bolai. Every song is under His direction. 2. Dharamsaal: The Earth is a beautiful temple where we come together and sing. Places of worship are made so saints can get together, meditate upon the one and sing the ONE's praises. The purpose of life is to sing and the earth has been designed to be a place where this singing can be done. The earth has been designed by God to come together and sing. Earth becomes beautiful when we come together and sing. What is singing other than just following the command of the ONE. Gurbani says Sabhai Ghat Raam Bolai or Every heart is singing in the temple of the earth. 3. Rijak: Why do we need to worry when we know we will have food! In Sodar Gujri, Guru Arjan Dev asks, "Why, O mind, do you plot and plan when Waheguru, the Pritpaala, the Deen Dayaala, is there to care for you. Even those living beings that are created in the rocks, they get nourishment. Its not the fathers, mothers, children or spouses; its God that provides for every single one. Why is there any need to be afraid. Flamingoes fly hundreds of miles, leaving their young ones behind. Who feeds them, and who teaches them to feed themselves? Have you ever thought of this, dear mind? The one without any end takes care of everyone, the omnipotent one. Slave Nanak endlessly loves the one who holds all power in the palm of His hand." At the time of Guru Arjan Dev, Bhai Gurdas explained in detail what this really meant using many different examples in his second Vaar. This vaar has 20 pauris or poems that each end with the phrase "Aape Aap Vartada". This must have been an important topic of discussions. Perhaps a lot of questions were asked about God permeating everything. That's why Bhai Gurdaas has given this concept so much importance. Bhai Gurdaas's Vaar 2.